Following are pics of conversion. This one shows spacer behind the washer and nut. 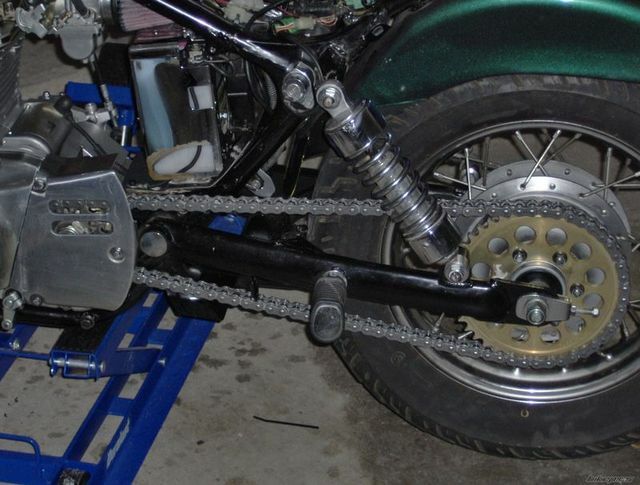 This shows how close chain runs to belt guard bracket. The smaller 14 tooth sprocket might mean removing bracket. This shows the sprocket I cut the 40mm OD center out of to make the spacer for behind the washer and nut. Here is a look down the chain. This the complete view. Just put covers on, and enjoy!! Here is a chart showing the difference in RPM at the same speed, comparing stock gearing on left and new gearing on the right. Here is another chart for a different ratio. 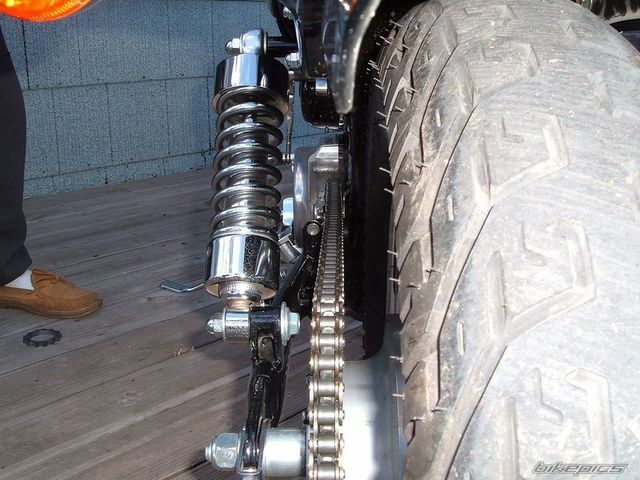 That is just two examples of what you can do by changing gear ratios and how it affects your rpm and mph. Keep in mind that a one tooth change on the REAR sprocket is a 2.5% change in gearing. 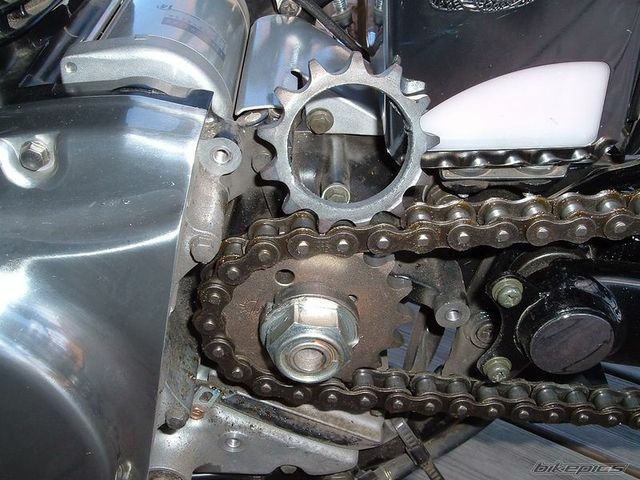 For every one tooth change on the FRONT sprocket it is a 5-6% change in gearing. These sprockets fit a number of models and years. Most of the sprockets for the GS, GSXR, GSX's work. The .? is for whatever tooth number you want. You can see at the links above all the models that share these sprocket designs and then buy a sprocket for anyone of these models, from whatever sprocket manufacturer you want. 1996 Mirage paint, seat lift, 2 #4 washers, 155 main, 52.5 pilot. Removed pillon, belt guard, rear blinker mod, moved battery box. K&N cone, Chain conversion 17/43 (in process). Cam tensioner mod. If you want to shop different prices and manufacturers, the Motorcycle Superstore carries 3 brands of sprockets that fit the Suzuki GS550 model....and other Suzukis too. 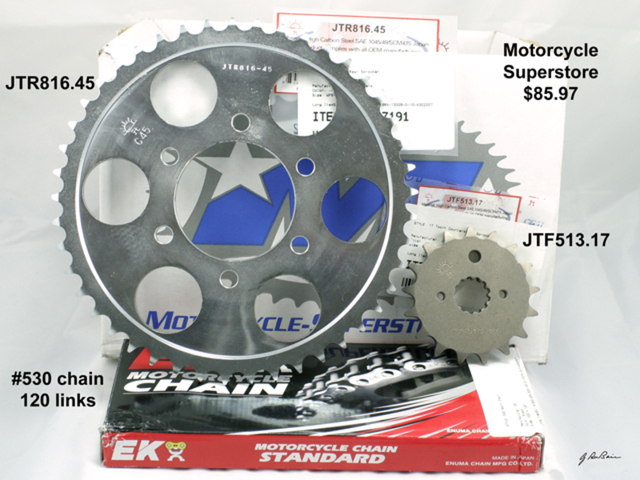 At this time the Motorcycle Superstore has 2 day shipping and free for orders over $75...that'll get both sprockets and chain, delivered for free. The brands are AFAM, Sunstar, and JT Sprockets. The JTs are the cheapest...and cheaper than my dealer too. Go here for the sprocket list. Go here for the chain list. I chose mine from the GS550L model with the 17/45 set and 120 link 530 Roller Chain (cheap like Hutch) to make a little different comparison. I put over 100 miles on the 17/43(2.53 ratio) conversion and really got the feel today. In town it is a 3rd gear no jerk affair at 25mph. 4th gear for towns with 35-40 speed limits. Back roads are an easy smooth rpm at 55-60(speedo reads 48-51) going with the traffic. On the interstate at 70-75 (speedo reads 60-65) it is a joy now. It falls into a super smooth rpm where the exhaust note gets hard to hear without leaning that way to hear it., and I have the loud Jardine muffler. SMOOOTH. Passing a semi is no problem, even in the turbulance at the cab door of the truck. Down shift only needed if a heavy head wind. The best way I can describe the all around performance of the bike with this ratio is to compare it to another bike. This will not help the younger people on this site, but I know I am not the only middle aged person here. Aceleration is a STEADY, STRONG pull in all gears. with 5th as an overdrive. It feels just like a Triumph 750 twin of the 70's. Only a LOT less vibration. It is perfect. I thought I would be spending most of my time with the 14/43 (3.07ratio)combo on it for everyday driving, and going to the 17 on the front for when I wanted to hit the e-way for long trips. I believe it is going to be 17/43(2.53 ) MOST of the time now, and ONLY switched to the 14/43 (3.07)when I just want to smoke most everything else from 0-60. I can't believe how much nicer a bike it has become. I did get a chance to find out how far my speedo is off. I can't belive I did this, but I saw a State Police Officer at the ramp when I got to the e-way. I told him the story of the conversion and that my speedo was off. He agreed to follow me on to the e-way and let me know when I hit 70mph. The speedo is off by 10mph. When it said 60 mph it was 70.Below 55 it is off by about five mph. I did have it up to a speedo reading of a little over 80mph(95 actual, not with the cop around) and I was in the 3rd lane passing everybody. I came home and figured everything out, and either my speedo has been reading slow to begin with or something. The gear change is a 14.5% change, but the real speed, compared to the speedo reading, works out to a 17% change to be correct. Oh well, all I know is I LIKE IT. It is a much more VERSATILE bike, but that is my oppinion, as much as that is worth. In more hilly country or when carrying more weight(200lb+ rider or carrying passenger) I believe the 17/45 (2.65 ratio), or the 16/43(2.69)would be a better choice. That is why I went with the 43 back sprocket. You can cruise flat land with the 17/43, hilly with the 16/43, and smoke with the 14/43. There is no problem with clutch slippage using the 17/43 conversion, so far. Since hutch mentioned clutch slippage, if you go to a gear ratio that is high like 2.5-2.75 it may be an issue. the springs on the savage are not that good so here are the part numbers for a high friction plates and springs from bike bandit. Bike bandit sells the vesrah plates and springs for the savage. These should take care of any clutch slippage that is caused by the additional load generated by these gear ratios. Oh, and the conversion was totally worth it. at 17/43 in fourth gear i am where i used to be in fifth gear. SO now I have an extra gear to play with 80 mph is now an easy lope with still alot more throttle to go. 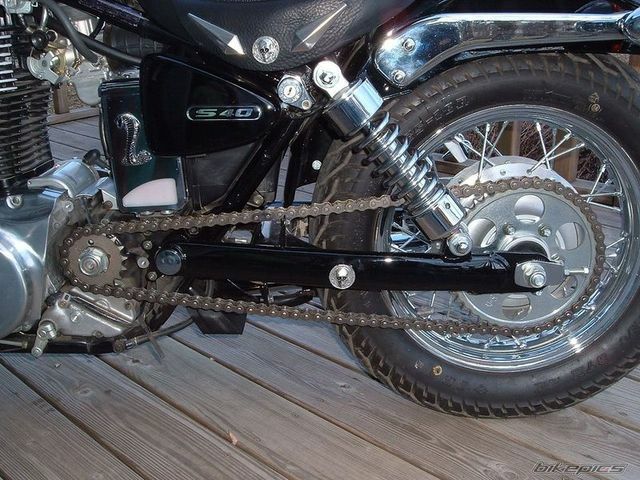 45/17 combo with chain from the Motorcycle Superstore with free shipping for orders over $75.00. Reference sprockets for the Suzuki GS550. 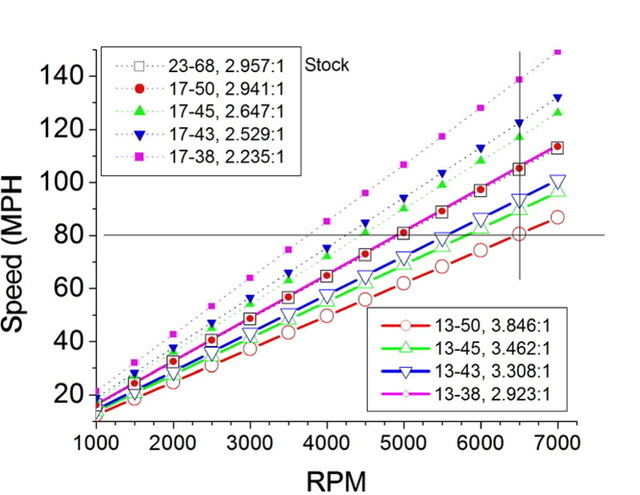 Based on Hutch's numbers for 5th gear, stock tire, I made these theoretical plots for various gear ratios. The format is Speed (mph) vs rpm. The vertical black line represents a 6500 rpm redline. The horizontal black line represents 80 mph. notice that the 13-37 and the 17-50 are pretty much the same as the stock 23-68.
with the 17-38, you could do about 135 mph, but it would take you forever to get there. The GS rear sprockets WE need have a 100mm bolt pattern. I know it says above we need the ones for CAST wheels, but at the shop I went to they have them divided into "spoke" and then all others. I got one for "all others" thinking "spoke" meant wire spoke wheels. We'll, the one I got has a 73mm bolt pattern so I'm headed back today to get the right one, ruler in hand. Last reminder, LOOSEN THE DRIVE PULLEY NUT BEFORE YOU TAKE THE REAR WHEEL OUT! Or it won't come off at all. I got a little gung-ho and forgot and wasted about an hour. Plus I skinned my knuckles and it really really hurt. There, now you have no excuses. <$100 and it makes room for bigger tires, let's YOU pick your performance style, and is easily fixed if you have a problem on the side of the road! Throw a chain, toss in another master link, throw a belt, call a tow truck! EDIT>>> Instead of buying a 13-tooth front to make a spacer (I don't work in a machine shop anymore and don't have any way to cut it at home) I bought 2 7/8" washers and after 5 minutes with a dremel they fit over the spines just fine. Also, this way I was able to sandwich my drive gear between them to help compensate for the offset of my rear sprocket as a result of the 165R15 tire mod. The nut has a recess that allows it to fit over the splines to press on the spined lock washer too, so it's good to go. Out of my way, I have to pee! Thumpinsquid mentioned using 2 7/8" washers as spacers. But he had to dremel them a little to fit. I picked up 2 1" washers at the local ACE, no dremeling required. They slip right over the shaft perfectly. But check the outer diameter. There were two choices at my ACE. One was perfect, the other was slightly larger overall and I think might have interfered with the chain on my 16 tooth sprocket. And man I wish I had done this conversion on Day One. I went to 16/43 and it is awesome. I would have went 17/43 like some others, but I like going back home in the mountains sometimes. It doesn't feel, though, like a 17 would keep me from climbing. I may try it out when time to replace the chain. I was a little bitter at first because it seemed like nothing had really changed, and then I remembered that the speedo is now off, which explains why the wind resistance was so much stronger at "70mph". Thanks to Hutch, Thumpinsquid, Savage_Greg and all the guys who contributed to this post. Its like having a brand new bike. [edited to add} Also I had to take my rear belt pulley to my local auto shop to break free the six nuts holding it to the hub. No charge, because we change oil on two vehicles there 3-4 times per year, but it made the conversion simpler. BTW - I didn't think about it at the time, but the "standard" chain pictured above (and other comparable ones) is rated for street bikes "up to 350 cc" maximum. 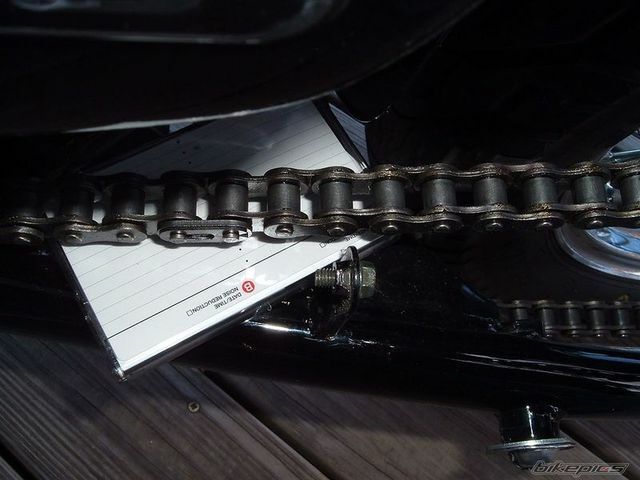 Since I'm changing sprockets again, I decided to get a higher rated chain this time. I bought an EK 530 SROZ o-ring chain instead. It is rated for bikes up to 50 HP. It still cost more at $80, but that would be a small issue if I had a chain problem a long distance from home. This is an excellent and informative thread, thanks guys. One item I see missing from the top pic is a locking washer. You could do this yourself by fitting a large (but thin) washer between the spacer and the nut and then flattening one side down at 90% so that it retains the nut from loosening. 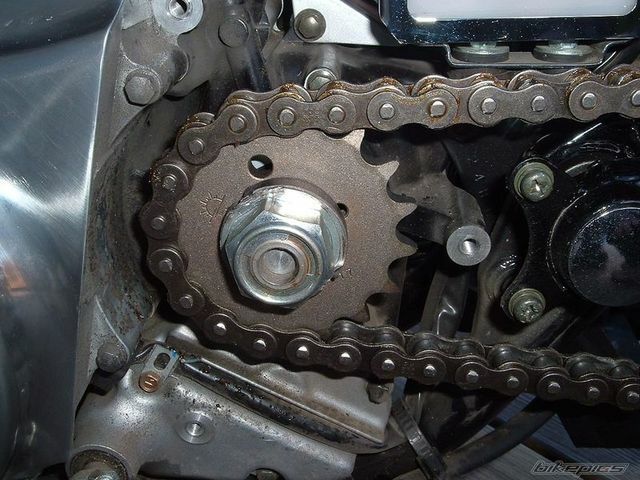 (There are other ways of ensuring that the sprocket nut doesnt loosen, but the washer idea is simplest). Note the internal dia of the washer would have to be 'keyed' to fit the shaft splines. Hope you can picture what im describing. If not ask your buddy with a std sprocket set up to let you have a look at how the sprocket nut is retained.. on Jap bikes it typically is as I described. i actually made a post on rubber side down but since it was recently being discussed here, did anyone figure out a good number of teeth front and rear for an 87 4spd? looking for close to stock with a little more highway friendly?